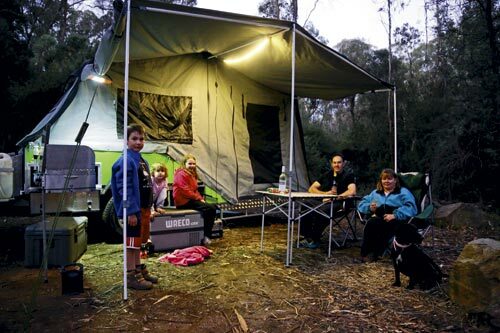 When you pull into a dark, wet foggy campsite with two kids (aged six and four) and a pooch, all beside themselves after the long haul, you almost need a magic wand to get that overdue frothy into your stubby holder. The wand didn’t exist but, luckily for us, the Cub Kamparoo Daintree LE. 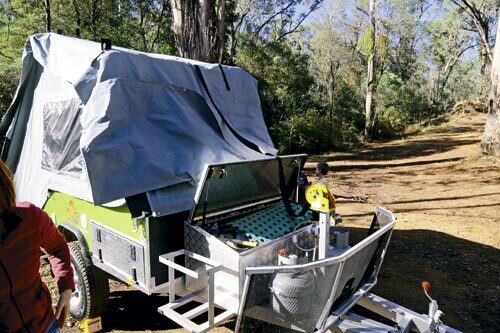 It was the first time we’d set up the trailer, but within ten minutes we were having a drink and socialising with the extended Jones clan with whom we had come away for the Easter long weekend. When it comes to setting up, Cub’s experience really shines through. 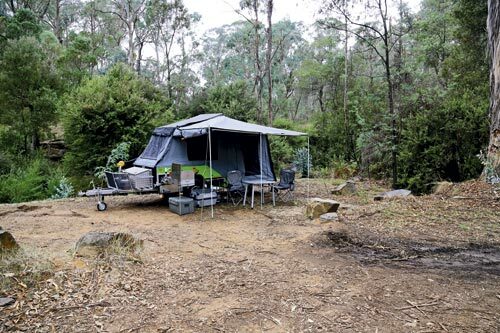 Aimed chiefly at the empty nester and retired couple, the Kamparoo Daintree LE is a trailer almost anyone from eight to 80 can set up. Press-button operation aside, it’s as easy as it gets. 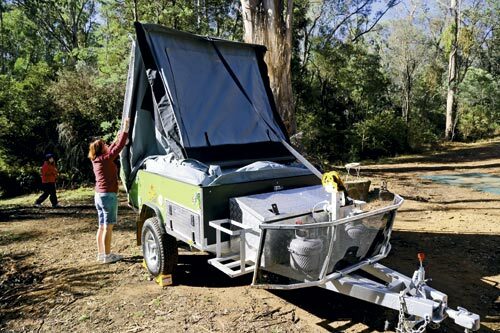 Simply level yourself, flick the four latches providing the dust-free seal, unwind the hand winch and flip open the hardfloor. Next, erect two stabiliser poles inside, drop the stabiliser legs on the four corners of the floor, press the studs around the base and you’re done. I loved the stabilisers: so simple with no winders, knobs or holes to line up — just tighten a classic handle on a thread and let gravity do its stuff. 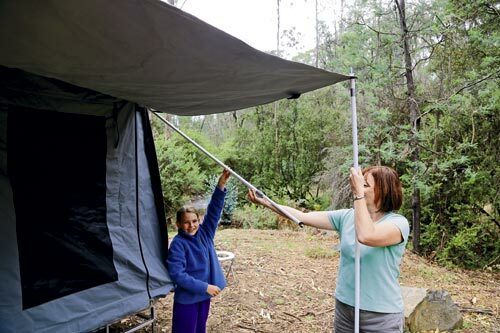 An awning shelters the kitchen area and tent access for longer stays. 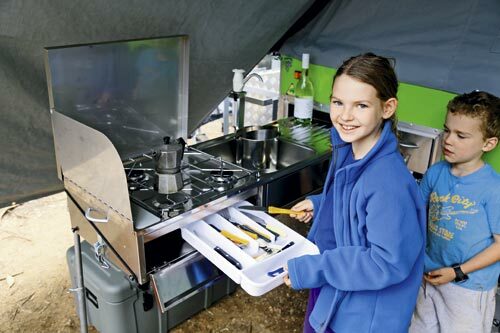 Stored over the roof for travel, it flips over and set ups with minimal fuss. 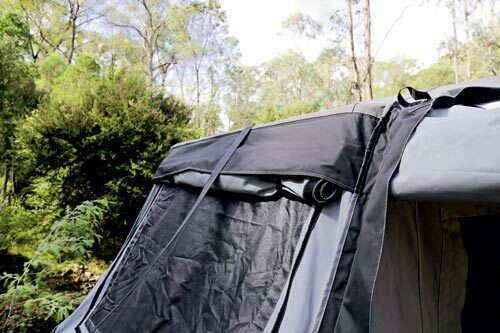 Shorter folk will appreciate how the annexe spreader bars are attached to the main tent: not by fiddly holes to thread but with hook and loop strips you can smooth out with another pole. I also liked the wing nuts which stopped the awning flapping around. A guy rope at each end steadies the awning in wild weather. 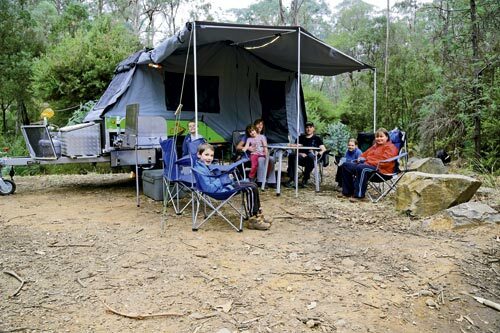 Although aimed at the couple market, family shoppers shouldn’t overlook the Daintree LE. 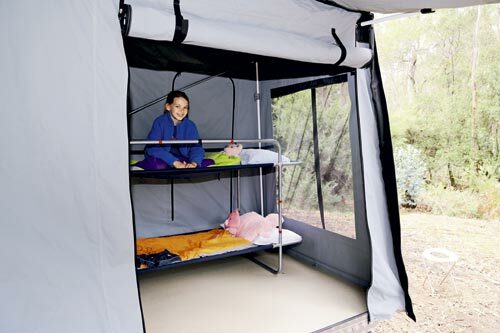 There was enough room for the four of us once we’d set up the bunks, and access to storage was still a breeze. 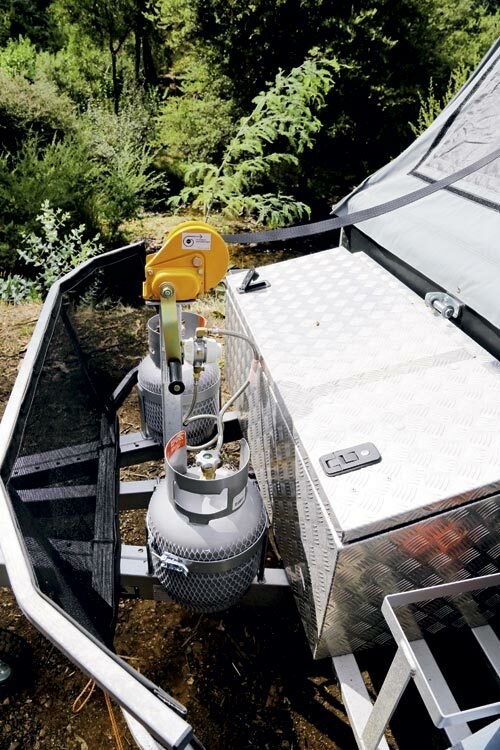 The bed lifts on gas struts revealing a cavity for bags and clothes to keep the trailer tidy and free of tripping hazards after dark. Living in a trailer over a long weekend reveals things you otherwise wouldn’t see at a show. 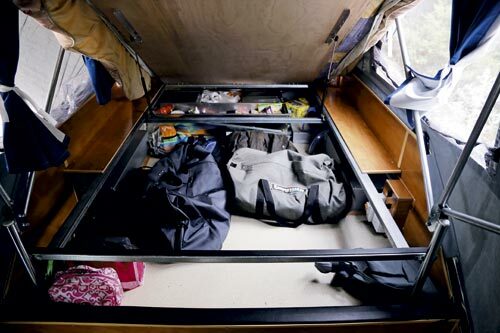 The ledge for the storage under the bed is arm’s length from the door, which is great from a liveability point of view. 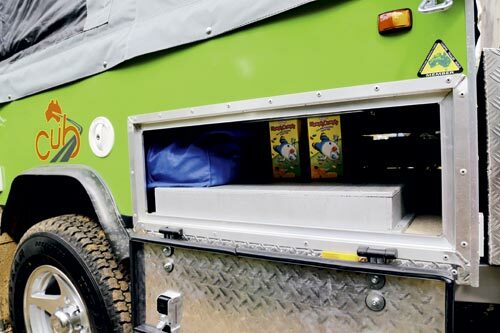 It keeps things like toothbrushes, glasses and books secure and easy to find and you can grab them without removing your boots or trampling dirt across the floor. 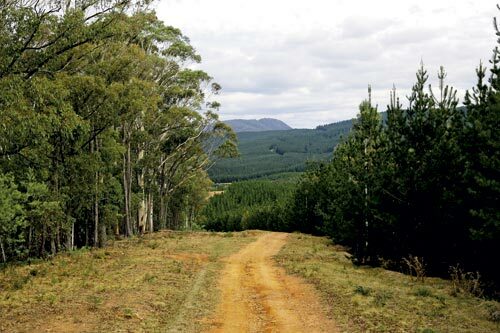 The high-density foam mattress was adequate for our short stay, but for a long trip I’d upgrade to an innerspring. 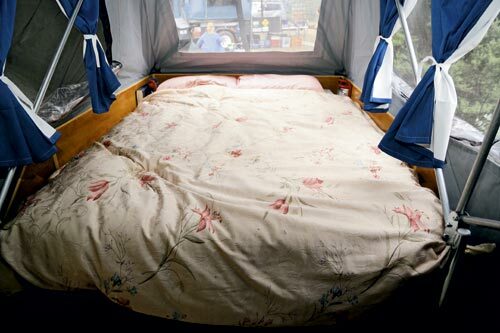 There’s space beside the mattress on each side for books and the curtains on the side windows are homely, though Kimberley found them fiddly and would have preferred simple zip-up canvas. 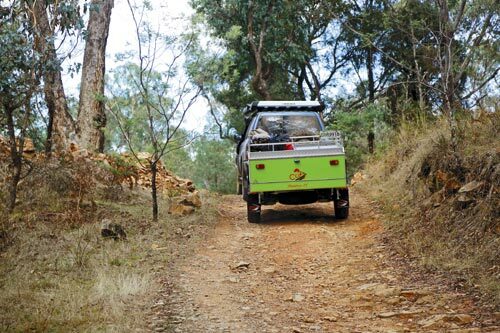 The trailer on our test came with no lighting as standard but there are 240V and 12V outlets to fit a fluro or two. I would have preferred reading lights and a strip lighting on the roof included as standard. “Brad! !… I want this kitchen,” declared Julie, the Jones clan’s Easter trip ring-in. 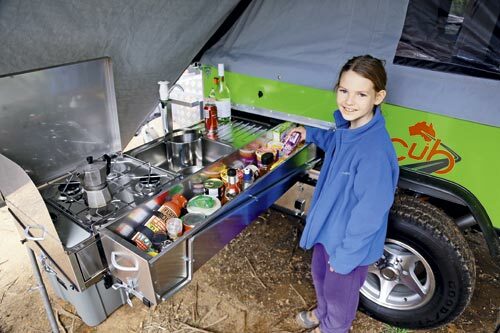 Kitchens on trailers are like kitchens in houses: they sell them and add value. The Cub offering is no different. 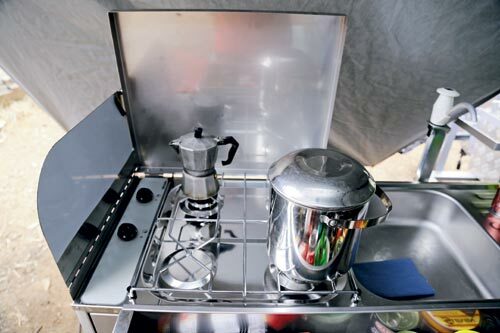 Quick roadside cuppas are a breeze, flick a couple of latches and a classy stainless steel offering slides forth. 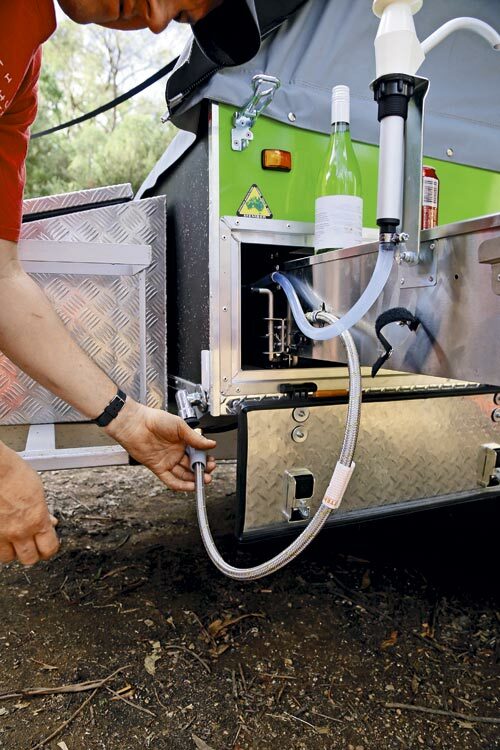 It comes with a two-burner Thetford stove, wind deflector, fed by a quick release bayonet fitting to two 4kg bottles, a sink, manual water pump fed from a 80L water tank and a small food preparation area. 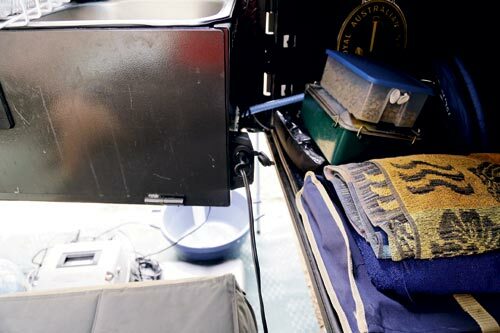 Storage for cutlery and kitchen utensils is via two large drawers underneath. A neat, compact slide-out pantry next to it completes the galley. 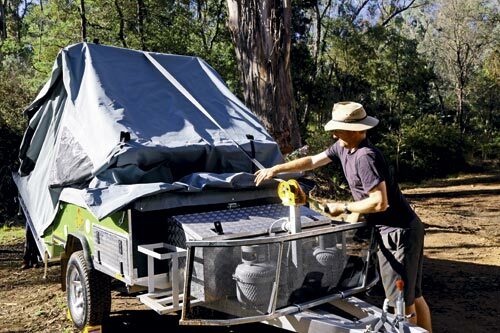 The Daintree LE comes with a stone deflector and a handy storage bin on the A-frame (if you are after a fridge box you can option up) along with the two gas bottles and a couple of jerry can holders. 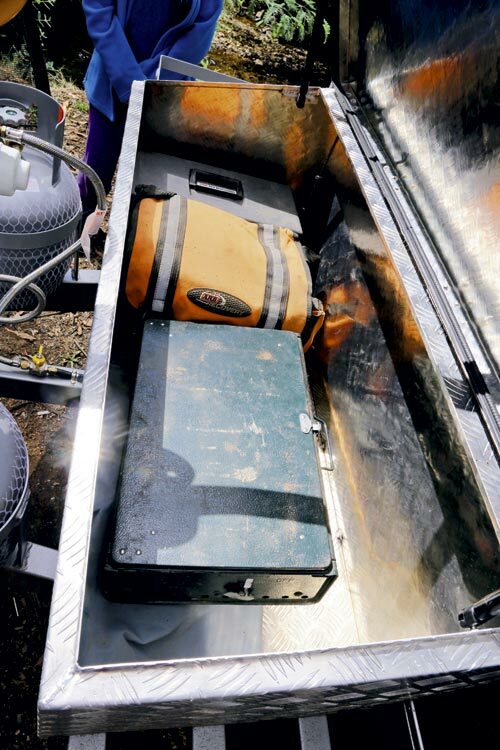 The bin is great for bulky items — I used it for our ARB recovery kit, tools, tarps and coats — and there is a small storage area on the other side of the slide-out kitchen. This isn’t huge, but it’s handy. I used it as an Easter Bunny stowage area. I’m confident it’s not what the maker intended but it kept merchandise free from prying eyes before Sunday morning’s ‘visit’. 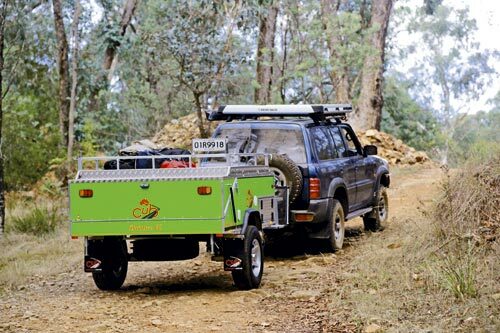 Offroad, this trailer is at the top of its class. It’s light for a hardfloor at under 700kg dry (1000kg ATM), has excellent clearance and departure angles, smooth independent suspension and mechanical override disc brakes to bring you to a halt. 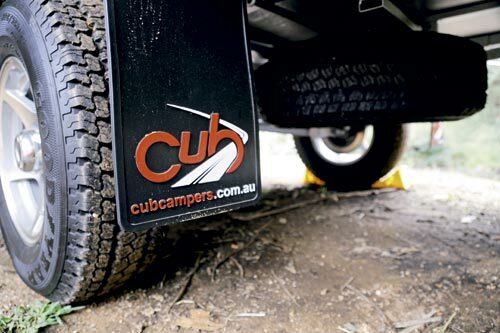 It’s well sealed against the bulldust permeating our beloved bush and any bugs have been ironed out throughout Cub’s four decades’ of experience, giving you the confidence to haul it wherever you want to go. 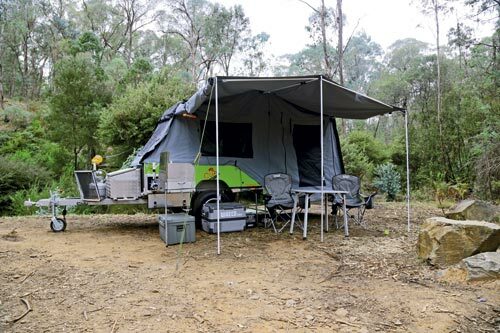 Although aimed at the empty nester, the Daintree LE performs beautifully as a family tourer and comes with clever innovations to make the most of its typical hardfloor dimensions. 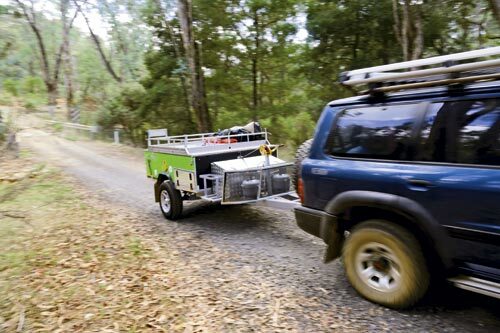 You can fine tune the trailer with the long list of options to your personal requirements and the absolute ease of set up is welcome when you’re trying to keep the billy lids at bay. 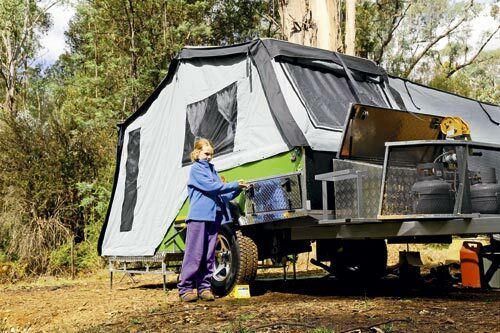 Find Cub campers for sale. 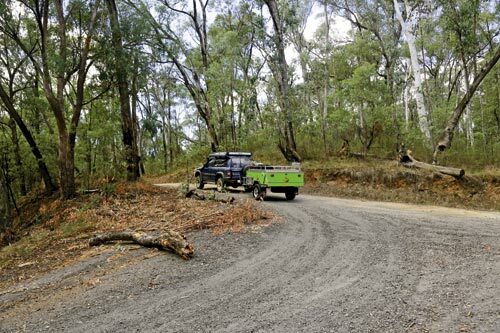 Search for new Cub campers.